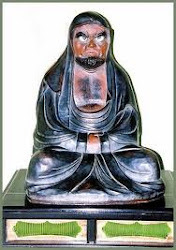 which first appeared in Japan during the Jōmon period. They are often found in mounded tumulus graves as offerings to deities. They continued to be popular with the ruling elites throughout the Kofun Period of Japan, and are often romanticised as indicative of the Yamato Dynasty of Japan. They are mainly made of jade (翡翠), agate (瑪瑙), quartz (石英), talc (滑石), and jasper (碧玉). Some consider them to be an Imperial symbol, although in fact ownership was widespread throughout all the chieftainships of Kofun Period Japan. 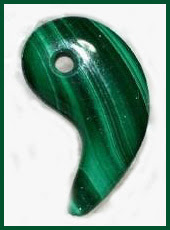 It is believed that magatama were popularly worn as jewels for decoration, in addition to their religious meanings. In this latter regard they were later largely replaced by Buddhist prayer beads in the Nara period. 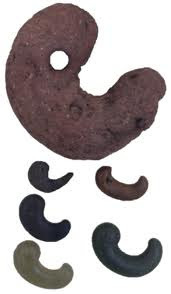 The most important magatama is the Yasakani no Magatama (八尺瓊曲玉, also 八坂瓊曲玉), which is part of the Imperial Regalia of Japan, added some time around the Heian period. 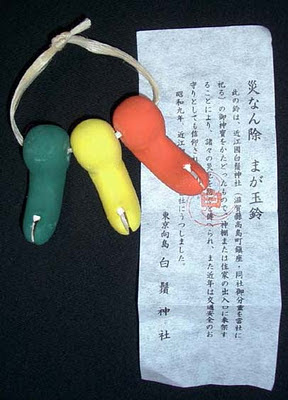 The Yasakani no Magatama stands for benevolence, and is one of the three items used in the ceremony of imperial ascension. In Japanese mythology, the jewels, along with the mirror, were hung on the tree outside of Amaterasu's cave (where she had hidden) to lure her out. It is believed to be a necklace composed of jade magatama stones instead of a solitary gem as depicted in popular culture. 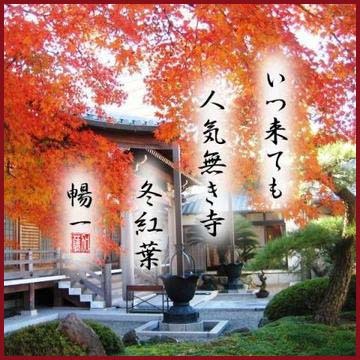 It is believed to be enshrined in Tokyo, in the Japanese Imperial Palace.
. shinkyoo 神鏡 Shinkyo - "mirror of the kami", divine mirror . 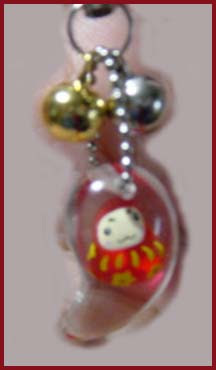 If placed at the entrance of the home, they prevent fire and protect from evil. 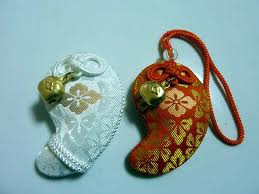 Magatama is seen as a symbol of sun and moon together, or as an embryo in the mother womb.
. Magatama from Izumo .
. Shinbutsu Pilgrims 神仏霊場巡拝 . 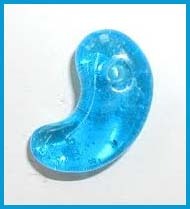 get a magatama at the last holy place. 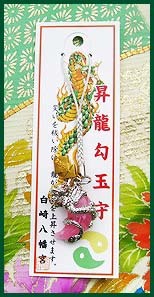 To bring you good luck, climb the jewel like a dragon. This shrine has a lot more interesting amulets. 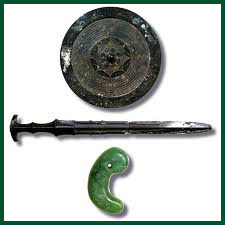 The MAGATAMA (Jewel) along with the KAGAMI (Mirror) and the TSURUGI (Sword) comprise the SANSHU-NO-JINGI (3 sacred treasure of Shinto). Literally these treasure are known as MIKUSA-NO-TAKARA-MONO. MAGATAMA: the spirallic jewel form of Magatama is the fundamental structure of creation.....from the infinite expanse of the Great Nature, sprouting like a reed comes the primal formation of the spiral form...our human forms echoes this process in the womb....Shinto, from remote antiquity could intuit that all life and growth from the form of Galaxies to the path of photons (light) follow the spiral form of materialization. The meaning of the jewel/magatama is to remind us of this process and enhance our life power. 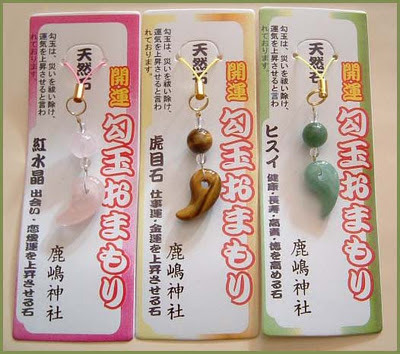 According to O-HARAHI-NO-KOTOBA jewelry made of Magatama, Kusatama and Kudatama twisted with thread of KI represents the Ikutama (signifies an activated soul, coming into awareness) of all things in Onogorojima (self-condensing ball; Earth Ship) and all things in Great Nature. 2) Pink Suisyo, Rose Quartz Heart, Love, Good relation, the soft pink colour of this quartz leads to kindness and stable emotion. 3) Murasaki suisyo, Amethyst.. Highest colour vibration/ healing stone. 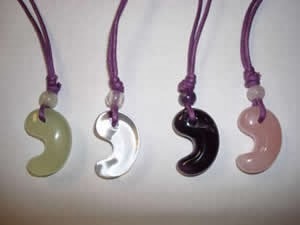 4) Hisui, Jade..Calming, dispell misfortune, bravery in face of adversity, increased patience, protection of love and friendship.
. . . CLICK here for Photos of Magatama Pond ! Do NOT post spam to this entry !